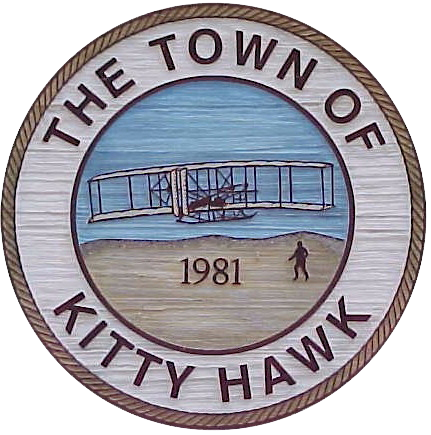 Kitty Hawk is located on a barrier island. By definition, a barrier island is a strip of land that evolved to absorb the ocean forces and protect the mainland. Ocean overwash, hurricane force winds, heavy waves, and erosion are natural processes that affect barrier islands and contribute to a dynamic shoreline. A barrier island left in its natural state is a constantly changing entity. An island with little or no development has few problems adjusting to the forces that nature places upon it. However, problems do occur when people build immovable objects on an island that is in a constant state of change. The topography of Kitty Hawk is relatively flat, with elevations ranging from 4 to 38 feet above mean sea level (MSL) per the North American Vertical Datum of 1988. The Town is approximately 3 miles wide from the Atlantic Ocean to the Currituck Sound at the widest point and approximately ¾ of a mile wide at its narrowest point. The majority of the Town’s 8.8 square miles is located within a Special Flood Hazard Area (SFHA) and is susceptible to flooding. The Town has 1.29 square miles of land located outside of the floodplain, or about 15 percent of the Town’s land area. The major natural hazards that Kitty Hawk faces are Nor’easters, hurricanes, flooding, and coastal erosion. Other hazards that Kitty Hawk faces are severe thunderstorms and tornadoes. The primary source of flooding in the Town of Kitty Hawk is storm surge generated by tropical storms, extratropical storms, and hurricanes in the Atlantic Ocean. Breaking waves associated with these storm systems can have a more devastating effect on the coastline than the higher water levels. Not all storms passing close to the area produce damaging storm surge. Storms producing flood conditions in one area of town may not necessarily produce flood conditions in other areas of town. The potential for flooding is present during every season. Recent examples of flooding from hurricanes are Hurricane Isabelle in September of 2003 which caused flooding and wind damage with major damage on the oceanfront and Hurricane Irene in August of 2011 which caused major flooding along the Sound and areas of Kitty Hawk Village. First and foremost, you should become informed as to the flood hazard potential for your property. The Town of Kitty Hawk Planning and Inspections Department can review floodplain information and studies available in their files to determine the location of your property with respect to the floodplain as established by Federal Emergency Management Agency (FEMA) studies. You may request a site visit for a review of the property’s flood problems and ways to stop flooding or prevent flood damage. You may contact Planning and Inspections at (252) 261-3552 for assistance with map determinations, to obtain copies of Elevation Certificates for specific properties, and/or any other questions.